This post is very delayed, as it has been about a month since I was in Philadelphia. Regardless of the delay, I can't say enough about my awesome dining experience at Alma de Cuba. I visited the restaurant with Jen, Traivor, and my brother Jeff. As Traivor and I approached the restaurant I was impressed with the entrance, designed to look like the entrance to a building in Havana. When we walked in we were both very surprised by the interior decorations, as they were much more modern than the facade belies. We were treated particularly well because our waitress was a former co-worker of Jen's and were told upon being seated that the restaurant has a gluten free menu. You can check out the restaurant's gluten free menu here. Our waitress made sure to send over an order of guacamole with plantain chips that would wow even the most seasoned guacamole expert; it was prepared with truffles and was unbelievably delicious. We all practically licked the bowl before we let it be taken away! The group then decided to split a ceviche sampler and my waitress was very helpful in pointing me towards what I could and could not eat on the sampler. We all really enjoyed the different flavors, with my favorite being the Shrimp ceviche with fire-roasted tomatoes, orange juice and avocado. For my entrée I went with the grilled bronzino which, again, was excellent. I wish I could remember the finer points of my meal at Alma de Cuba. Since it's been so long I'm having difficulty remembering everything about the meal but what I do remember is walking out of the restaurant onto Walnut Street extremely satisfied with my meal. 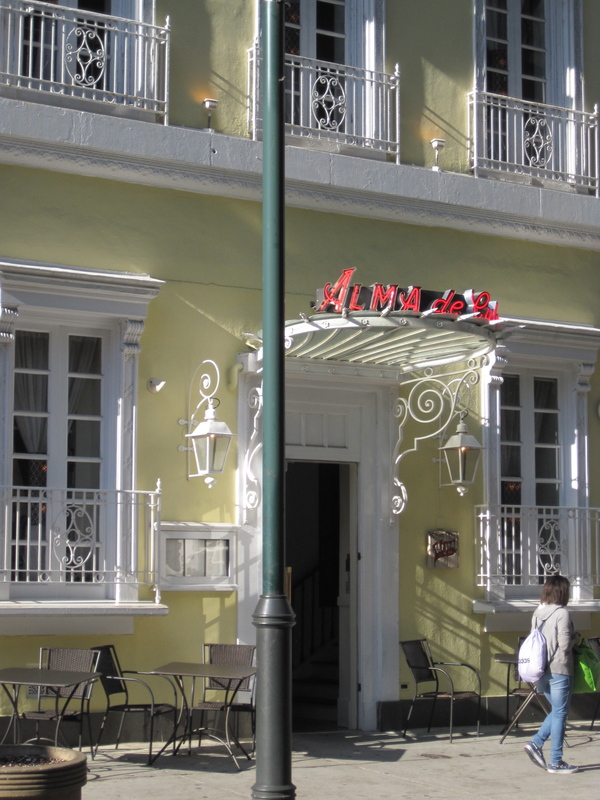 If you're gluten free, are a fan of Latino food, and visiting Philadelphia, Alma de Cuba should definitely be at the top of your list. After leaving Asheville, NC (check out an updated post here with another post coming soon) I headed down to Charleston, SC. It was my first visit to Charleston and I was pleasantly surprised by the city; the water views are gorgeous, the history is very interesting, and the people are extremely friendly. It also doesn't hurt that the weather was beautiful, with plentiful sunshine on most days. Of course no city visit would be complete without surveying the scene for gluten free folks and I have definitely done my part to try and steer you in the right direction for your next visit to Charleston. 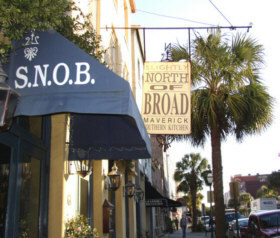 On my first night in the city I headed to S.N.O.B., which stands for Slightly North of Broad. I was a bit surprised by how dark the restaurant was when I first entered; it's easy to forget what time it is outside because of the decor and dim lighting in the restaurant. I had read about the restaurant in the New York Times' 36 Hours in Charleston article so I was excited to check out the food regardless of the dark decor. You can check out the restaurant's extensive gluten free menu here. Our waiter was extremely helpful, even pointing out that the vodka the restaurant uses are made from corn so all of the vodka drinks were gluten free friendly. I couldn't resist having one and ordered the Huck Finn, which was delicious. You can check out the full cocktail menu here. For dinner I went with the Kurios Farm Bibb Lettuce Salad and loved it. The creamy avocado dressing was a special treat having come from New York; I became so accustomed to fresh avocado in L.A. but can't seem to replicate the experience in NYC. The dressing was delicious and paired perfectly with the Bibb Lettuce. It was a difficult decision for me between the flounder and the vegetable plate, but I ultimately went with the flounder because the vegetable plate sounded interesting. The veggies rotate nightly and even hourly, as the chef decides which vegetables to prepare for each individual plate that is ordered. Ultimately the flounder sounded more interesting and I figured I should take advantage of being so close to fresh seafood. I again loved my dish and was happy to have great gluten free options available along with a very knowledgeable waiter. I would definitely go back to S.N.O.B. if I visit Charleston again despite the restaurant's dark decor and dim lighting. I definitely would have liked to see it brightened up a bit, especially because the city itself is so sunny. Who Is That Chick That's Rocking Gluten Free? Another day, another gluten free celebrity. I've previously posted about other celebrities who have jumped on the gluten free bandwagon, including Zooey Deschanel, Jennifer Esposito, Elisabeth Hasselbeck, Novak Djokovic, and Gwyneth Paltrow. This time it is teen pop sensation Miley Cyrus, famous from songs like "Party in the USA" and her Disney Channel TV show "Hannah Montana." According to this article at People magazine, Cyrus has recently been dogged by celebrity reporters about her increasingly gaunt figure. Miley responded with tweets to her millions of followers which encouraged them to go gluten free for the health benefits. She also mentioned having gluten and dairy allergies, so it seems she has adopted the gluten free diet under a doctor's orders rather than of her own accord. It's always nice to see somebody spreading the gluten free gospel, but one has to wonder: are there truly health benefits to going gluten free for those who have no doctor-diagnosed issues with gluten? A CNN article from April 2011 quotes various people in the health field about the potential benefits and Daniel Leffler, M.D., a gastroenterologist at Beth Israel Deaconess Medical Center in Boston and assistant professor at Harvard Medical School has said "Gluten is fairly indigestable [sic] in all people. There's probably some kind of gluten intolerance in all of us." However Dee Sandquist, a registered dietitian and spokesperson for the American Dietetic Association, warns that people who follow a gluten free diet can often lack Vitamins B and D in their diets so going gluten free is not necessarily a cure all. I appreciate having another celebrity face for general gluten intolerance but warn people to meet with their dietitian or doctor before jumping to a self-diagnosed gluten free diet. Will a gluten-free diet improve your health?